Whatever the reason, I was not handling myself well. The kids weren't listening to "No" and "Not now". I was snapping at them. They were yelling back. I felt like tearing out my hair. I swore if I heard, "Mommy! Mommy! Mommy!" any longer I would completely lose all sense of sanity. All I could do was sit in front of my computer at the kitchen table with my head in my hands and cry out to God, "I can't do this!" Have you ever had it where you wonder what exactly it means when people say that it's not us doing something, but Christ working in us? Have you ever wondered what it really means to say that it is His strength that allows us to do things, not our own? I so know what that means now. There is no other way that I can explain how one minute I am grouchy and snapping at my children, and the next moment I am able to respond calmly, with grace, and feel joy and anticipation for the day ahead. That little cry for help, "I can't do this!" and suddenly, all is changed. My God, His power is great. And He is so faithful to show up when we need Him the most. In our weakness, He truly is strong. Thank the Lord! 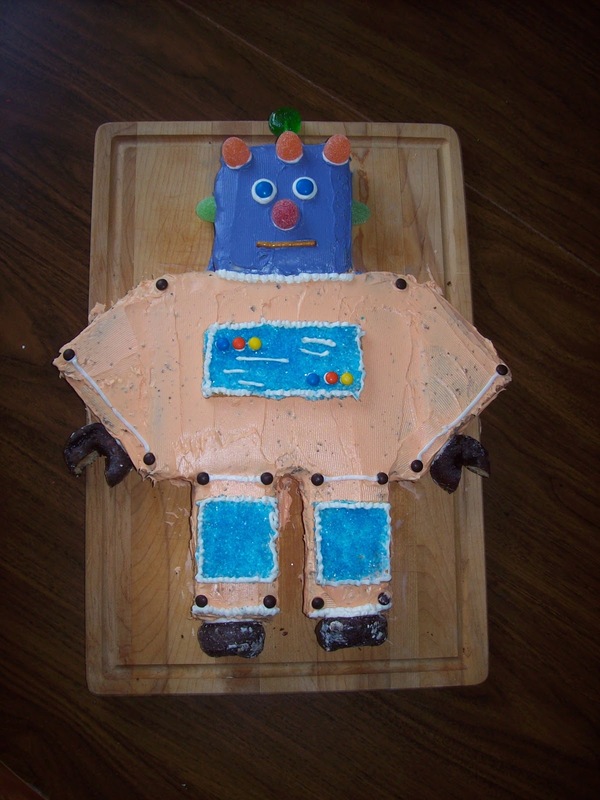 This is Reuben's robot cake. He picked it out from this list that has some pretty cool cake designs for kids on it, and they're generally quite easy to make. I will concur, although it helped that I didn't have to locate frozen pound cake for this particular design. The most challenging part of this was getting the icing colour right and then having to put said icing on parts of cake that had been cut out. 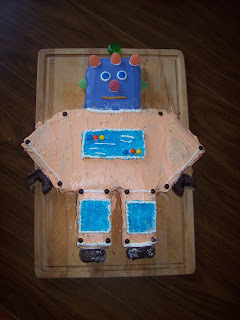 Maybe there's a trick to it that I haven't learned, but the cake kept crumbling into the icing. Anyway, as of the time I'm writing this (which is the day before I'm posting it), we haven't eaten this cake yet, but I anticipate that it will be quite yummy. I'll admit, I'm a little proud of how well it turned out. And of course, Reuben was pretty excited when he saw it, too. UPDATE: We ate the cake last night, and as anticipated, it was delicious, albeit confusing to cut pieces out of. There was a big, fat, ugly spider outside my kitchen window last night. It disturbed my view while I was doing dishes after supper by dropping down right in front of me. My first reaction was to recoil with an, "Oh, yuck!" I'm not generally overly afraid of spiders. I've had to get used to them as we have an abundance of your typical ceiling variety spiders in our house that the kids always make me kill for them. But this spider is a lot larger than our house spiders, and it's one of those creepy multi-coloured ones with stripes on its legs and funky designs on its body. But then, after I got over my initial horror, I took a closer look because the spider was doing something a bit unusual, (and when I say unusual, I just mean I'd never seen a spider do this before.) It turns out it was building a web in the corner of my kitchen window. It was actually pretty neat to watch. It would drop down really quickly, and then crawl back up, and then start pulling up the piece of web it had dropped, and then drop down again, and go somewhere different, and then attach a piece of web here, and then go over there and attach another piece of web over there. It's like it knew what it was doing or something. It's still rather dark outside this morning, so I can't see outside my window really well. But I can see enough to tell that the web is finished, and it is full of tiny flies that got caught in it overnight. I hope the spider is hungry today. We had a sermon at church yesterday about when Jesus calmed the storm. It's a fairly familiar passage where Jesus is asleep in the boat after a long day of teaching, and a storm comes up while he's crossing the lake with his disciples. The disciples are scared that they're going to drown, so they wake him up, and Jesus makes the storm stop. It's not that I expect life to be easy all the time, but I think to a certain extent, there's an expectation as Christians that if we're walking with Jesus, the storms of life shouldn't be quite as bad as they end up being. Anyway, it was a good reminder for me not to expect life to be perfect. I half expected the sermon to be pretty cliche, focusing on how Jesus is with us in the storm, and we just need to trust him to get us through safely, but the pastor ended up taking us in a bit of a different direction. He pointed out how after Jesus calmed the storm, the disciples were in awe and asked themselves, "Who is this?" And so he talked about how Jesus is God, and that the disciples were afraid because they forgot that. We might remember that Jesus is with us in the storm, but we also need to remember that this One who is with us is the All-Mighty Creator. He has the power to calm any storm -- not that he will magically make all of life's problems go away -- but when we turn to Him and trust that He, the Lord of all, is with us, we don't need to be afraid of the storms. He brings peace. I was reminded of an old downhere song I've been listening to lately, "Calmer of the Storm". And you say, "Peace, be still." Of the will that I so long to control. I thank you, Lord, You are the calmer of the storm." We can bear the storms of life when we trust Him to bring us peace. May you know that peace today, friends. When the mornings are cold and dark and the road of life seems long, may we never forget those heros of the faith who have gone before us, and may the brightness of the dawn always fill our hearts with joy and hope for the coming day. Peace to you, my friends. Yesterday, four years ago, I was 41 weeks pregnant. My midwife came for a home visit and gave me some tips for helping labour along. Contractions had been starting and then stopping every day for about a week. Yesterday, four years ago, Tim and I took our last (really long) walk as a married couple with no children. Yesterday, four years ago, we had some friends over for supper, and we had tacos with apple pie for dessert. Then we spent the evening watching TV, and I sat in the rocking chair, counting the contractions that finally didn't quit, and then everyone went home, and we called the midwife and went to the hospital. And on this morning four years ago, at 1:30 AM, a beautiful baby boy was born, and we called him Reuben. And today, on his fourth birthday, this boy-child crawled into my bed and snuggled in close, and I held my son, this man-in-training, and treasured the moment of lost sleep, thinking to myself that there won't be many more moments like these, so I might as well enjoy it while it lasts. I saw you eating my garbage last night. I was laying in my bed, ready to go to sleep, when I heard the crash of my garbage can hitting the ground as you knocked it over in search of sustenance. I knew I hadn't heard the sound of a car door, and I know you've been in my garbage before, so I snuck over to the window to investigate. There you were. Eating my garbage. You in all your masked garbage-eating glory. I tried not to think about the mess that I would now have to clean up in the morning. I tried not to feel like a horrible neighbour for not buying a garbage can with a lid that ties down, (although in all fairness, the garbage can came with the house). I tried to hope that the bag of cat poop I scooped from my furball's litter box tonight and put at the top of the can would deter you just a little from the actual garbage underneath. Apparently you didn't care about the cat poop because there is quite the array of garbage all over the street that I now have to clean up before the garbage man gets here. You are really, REALLY lucky it hasn't started raining yet or I would be even more annoyed than I already am. So be warned, Mr. (or Mrs.) Raccoon. Your garbage-eating days are coming to an end. I've decided that from now on, until we get a garbage can with a lid that ties down, I won't be putting my garbage at the road until the morning before the garbage man comes. I will keep it in my garage where it will be safe from your garbage-thieving paws. So. Ha. 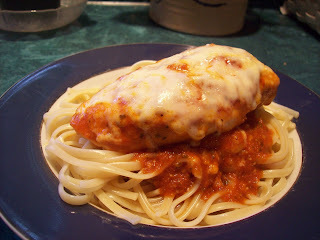 I found this recipe in my Fall 2011 edition of Kraft's What's Cooking magazine, and I love it. We've had it twice now, and I think it's going to have a permanent place among my menu options. Preheat your oven to 375 F. Pour the pasta sauce into a 13x9 inch baking dish. Stir in 1/4 cup of Parmesan cheese and add the chicken breasts, turning them to coat them in the sauce. Cover and bake for 30 minutes. When the chicken has finished baking, top with 1 1/2 cups of shredded Mozzerella cheese and some additional Parmesan cheese. Bake uncovered for about five minutes. Serve as shown. Seriously, this is one of the easiest recipes I've come across yet, and it was delicious. It's also really easy to halve the recipe if you're not cooking for lots of people. If you try it, let me know what you think! and consider all your mighty deeds. 13 Your ways, O God, are holy. What god is so great as our God? you display your power among the peoples. the very depths were convulsed. the earth trembled and quaked. May you, dear friends, take time today to remember the things, both great and small, that the Lord has done for you, and may you never forget that this God who loves us is capable of so much more than we could ever ask or imagine. Skill #1: I have created a system of doing the dishes whereby I can fit two meals worth into one drying rack. Actually, this might be a helpful skill to learn if you happen to have to do dishes by yourself on a regular basis. In doing this, I save myself much time and effort in having to both wash and dry all the dishes. If I fit them all into one rack, they can sit there and drip-dry overnight, and I can put them away in the morning without once picking up a dish towel. Skill #4: How to not panic when I get a phone call saying, "I'm in a tornado!" Okay, so I'm not so good at this skill yet. However, I am pretty good at searching the Internet frantically to find out any and all weather reports for any given location. Skill #5: How to drive near tractor trailers. Some people could use a lesson or two on this. Yes, they're bigger. Yes, in Ontario, they're also limited to a certain speed, and depending on how heavy the load is, they take a lot longer to stop than the average passenger vehicle. That said, I've learned never to cut off a truck, how to leave enough space for them to merge into traffic, and that sometimes following them in a snowstorm is a good idea. So there you have it, a few semi-useful skills to have as a Trucker's Wife. Enjoy! So I have come to realize that although I am generally very anti-Fall, there are two things about it that I don't mind. One, I can have the fireplace on again. When we originally started looking for houses, I would never have put a fireplace down as a "must-have". We found this house, and even though it already had one, it didn't really factor into our decision. Now that I've been living with one for almost a year, I don't think I could ever go back to not having one. It's that nice. And I love that with the onset of cooler evenings and mornings, I can have it on again. The second thing I don't mind about Fall is tea. Yes, I know, you can drink tea in the summer. But for some reason, I don't, at least not on any sort of regular basis. To my mind, it's too hot in the summer to really be able to enjoy a nice hot cup of tea. However, now that Fall is coming and nights are cooler, I can once again enjoy my cup of tea in the evening before bed. I'm not a tea snob. I don't get into arguments about whether bags or loose-leaf is better. In fact, I have both in my cupboard and dare say there are good and bad things about either option. At one point this summer, I made some tea using fresh peppermint leaves from my garden. Let me tell you, that was cool. My only reservation regarding teas is that I'm not really into the fruity ones, as in, anything berry-ish. I will on occasion drink a lemon or pomegranate tea, but that's pretty much my limit. I do love a good vanilla tea, but have yet to find one at the grocery store where I usually buy my tea. So there you have it. I don't totally hate the coming of the cooler seasons. And God is faithful. He brings me out of the dark places and covers me with the light of His grace. 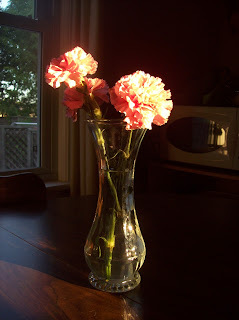 I am learning to see the gifts He sends me daily, such small things, like bringing a friend into work at the crack of dawn and the glorious drive home -- so quiet -- this chance to watch the sun greet the day, creating long shadows on the road in front of me, warming my face with its blinding light. Would that I could go through each day blinded in such a way by the great love of my heavenly Father! And this chance to praise Him, with the radio blaring loud and my heart pouring out thankfulness to feel such inexplicable joy. Moments like these should never be taken for granted, and I find myself beginning to understand how some people can be morning people -- not that I see myself joining their ranks any time soon -- but the overwhelming beauty of the early morning begs to be seen and enjoyed. There's two things that bug me. Okay, not just two things. But two things that I'm going to share with you lucky people today. First thing that drives me crazy: when I go to the grocery store, and they are completely out of stock of something on my list. As in, there's not even an alternate brand of said item to purchase. (Although I am pretty frustrated that my grocery store hasn't had any knock-off brand tomato paste in about a month, but at least I can still get the name brand kind...) Like on Monday, when I went to buy peanut butter, and there wasn't any left because, of course, it was on sale, and everyone else wanted some, too. Or like yesterday, when I did my bi-weekly "stock up the house" trip, and I had planned to make shepherd's pie next week, but they were completely out of shepherd's pie seasoning mixes. So now, I have to do one of three things: A) Make something else and hope I have everything I need. B) Make shepherd's pie from scratch, as in the seasoning in the meat part, which from experience, doesn't always work (tried making my own sloppy joes and it failed miserably), and again, I don't know if I have everything I need. Or C) I can go back to the store later in the week and hope they've stocked up. The second thing that drives me crazy has to do with my absolutely favorite past-time: reading. I hate it when a book doesn't have a little blurby on the back telling me a synopsis of what the book is about. I'm not saying I need pages of spoilers; I just want a little hint of what I'm getting myself into beyond what the title or location in the bookstore can give me. A book without a synopsis on the back drives me so crazy, I might actually do the unthinkable - flip to the back of the book and read the ending first. I know. Sacrilege, right? So unless the author is someone I already know I enjoy reading, if a book doesn't come with a synopsis, I will do the one other thing that prevents me from committing such travesty, I put it back on the shelf, and I don't read the book. Someone else can borrow it. Someone else can buy it. But I will let it rest, and a book that might be the greatest book in history will go unread by my humble self, just because some publisher decided it wasn't worth it to give readers a little taste of what hides inside those pages. And yes, this also means that I'm the kind of person who has to read the back of the DVD case before I watch a movie. That probably says something about me, but I don't feel like analyzing exactly what that might be. My coffee hasn't kicked in enough yet. So there you go, my two pet peeves for the day, missing grocery store items and books without synopses. The late summer sunshine peeks through the branches of the birch tree outside my kitchen window creating streaks of light across the counter as I do dishes once again. I have watched this tree blossom through spring and share it's branches with various birds throughout the summer. Now it's leaves are beginning to turn brown and wrinkly, that disease of Fall that inevitably strikes every leaf-bearing tree. I do not look forward to the day those leaves start leaving those branches to cover my lawn with hours of raking and bagging. I consider this gorgeous day a gift. After a week of gray and rainy, the chance to get outside and spend some time at a park by the lake with my children is a chance for my heart to heal just a little more. Friends, don't under-estimate the pain caused by a miscarriage. I hadn't meant to go this way today, but here we are. It takes time to heal from this loss, and bit by bit, I am getting there. Slowly, day by day, God provides gifts of light to ease the hurt in my heart. My children, so precious, are two of those gifts. To see the two of them playing along the beach, picking up stones and sticks and tossing them into the water, so innocent and free of worldly cares, a reminder of how to have child-like faith. The lake breeze blows the waves hard onto the stony shore. I sit with my face to the sun and just breathe, soaking in the last precious moments of summer. It appears that yesterday's sunshine continues today, and maybe we'll have yet one more chance to enjoy the last days of summer. Somehow, it's easier to cherish the sunny days when I know that they'll soon be ending. And today's gift: I've had the flowers for a while now, but the morning sun sneaked through the window in our front entrance-way and peeked around the corner to shine beams of light into the dining room and straight onto these flowers, a gift from Tim and the kids, and now a further gift of glowing warmth and beauty. May you, dear readers, take the time to see God's love for you today in the gifts of light around you. So we think Kaylee has chicken pox. It started with what we thought was a pimple on her forehead, and then she had a spot on her leg, and then two on her arm, and then another one on her arm, and two on her ankle, and one on her stomach. I started to think maybe it was bug bites, but they didn't look like any bug bites I'd ever seen before, and a thorough search of our house has not revealed anything that might be biting her anyway. So moral of the story, I'm stuck here at home with her this morning instead of heading to church, which is ironic, because the only place I can figure that she caught it from was at church. Assuming Reuben also catches it at some point, we could be stuck here at home for quite some time. Joy. Oh, and if there's anyone in the Hamilton area that really wants your kids to catch chicken pox, you are more than welcome to come visit. I don't know if her case is severe enough to be that catching anymore, but feel free to give it a go. The door is always open, and I'm told I make good coffee.